It’s always summer in San Juan, Puerto Rico. 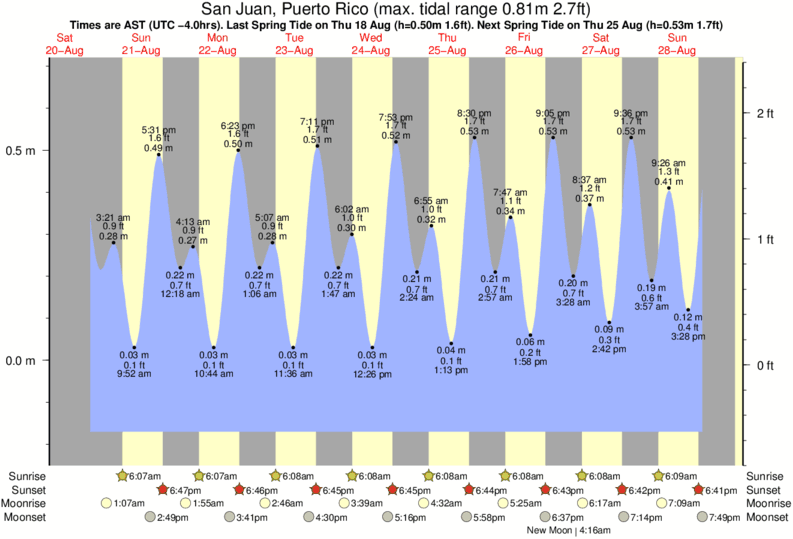 Below we provide current weather conditions, the weather forecast, local weather alerts, live precipitation radar, and NOAA links (tropical storm alerts, water temperatures, and tide predictions) for San Juan, Puerto Rico. In addition, we provide the average sunrise and sunset times by season for Puerto Rico. The best time of the day in San Juan is in the early morning. It is almost always sunny with very few clouds, if any, and a bright blue sky above. It is also cooler (great time to walk around) and the water is more calm. Typically, as the day progresses, it gets warmer, but a nice breeze picks up to help cool you off and causes more waves on the ocean. Sometimes, the skies become more cloudy with an occasional late afternoon shower or storm. Nevertheless, the weather is a different kind of perfect every day! San Juan is located directly in the center of the radar map box below – at the top / north end of the red highway line. Click Here for up-to-date information from the National Oceanic and Atmospheric Administration (NOAA) about any Hurricanes or Tropical Storms in the area. Live Puerto Rico Weather Radar. More Information about Puerto Rico Weather.